Today is the last day of my maternity leave. Somehow it feels like its been forever and yet almost no time at all since that crazy day when I was cleaning up my desk. 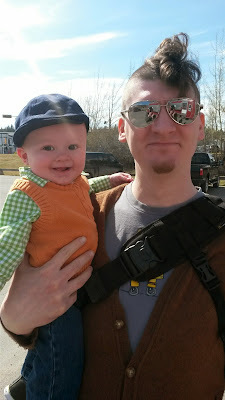 I'm excited to be going back to work but also a little sad to be missing out on all the fun times Chris and Axel are going to have together during the day. This weekend Chris and I celebrated the 7th anniversary of our first date. We were down in BC, as we managed to add some time with my family on to a medical trip. Axel needed to be fitted for a helmet in Vancouver to correct a flat spot on his head, so he'll be sporting some stylish headgear in his photos for the next 6 months. Between teething and coming down with a bit of a cold, Axel hasn't been totally his usual happy self over the last few days. But it's still going to be pretty tough to say goodbye to this smiley little baby tomorrow morning.